WARNING: This report shows and links to the most graphic images of tortured-to-death people, you can imagine. On March 17, 2015, the Syrian-Arab news site “Zaman al-Wasl” published, what it says were leaked pictures of Assad regime atrocities, committed in the Syrian capital Damascus between 2011 and 2013. Despite the pictures – part of a 55.000 files package – have been leaked since mid 2013 and confirmed real by CNN and the Guardian newspaper in January 2014, they have never been published since then for no know reason. Until now. What the pictures show is difficult to describe as hard to bear. Famished bodies of men, women and children, obviously tortured and starved to death and what seems to be a former military hospital, now (at least until 2013) being used as a concentration and death camp to detain, torture and kill people, seen as disloyal or dangerous to the regime of Bashar al-Assad. However the freshly released picture do not only show the unimaginable war crimes of a dictator, who’s methods and cruelty can be well compared to Nazi Germany’s Adolf Hitler; they also allow for the first time a geolocation of one of the death camps, revealing unbelievable facts. The pictures of some 20-30 dead people were taken in the yard of an army facility in the the upper Damascus quarter of Mezzeh in the north west of the Syrian capital, which also houses the palace of the “president” (illegal dictator) himself. And that is not all. A precise geolocation of the place could be established on the day of the release of the pictures, revealing that the concentration and death camp is located less than 500 meters downhill from the presidential palace, unveiling and unbelievable spatial proximity between the suspected whereabouts of the dictator and his family on the one side and the location of the worst imaginable atrocities on the other side. Using the possibilities of Google Earth, yet more terrifying details emerge. There was (or still is) indeed a direct sight line between the rear part of the Assad family’s palace and the located death camp, meaning it was theoretically possible for Assad, his family and his allies as well as international political guests to see with their own eyes what kind of war crimes, the regime is involved, namely killing tens of thousands of Syrians, not willing to obey the orders of the regime or just being members of the “wrong” religious belonging. 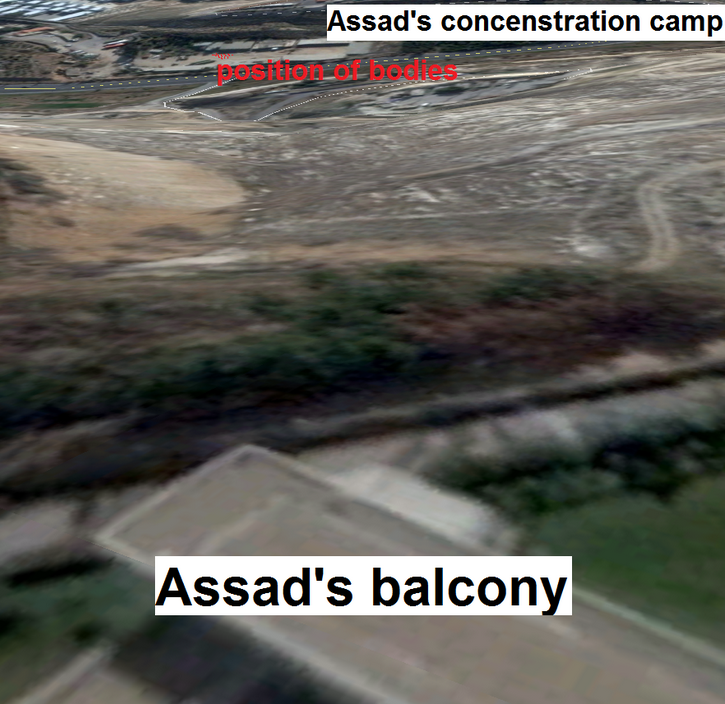 While it can not be proven, anybody ever took a look from the palace at the well visible bodies in the nearby death camp, it remains more than odd that the Syrian dictator took the risk of heaving his war crimes being established so close to his physical presence, family and international guests – mostly supporters of him and his policies. Hence the possibility that the visual axis was established deliberately to brag about the death machinery to guests or even “engage” in an abnormal “hobby” must be seen as likely. Last but not least, a look at the possible extend of the war crimes is also possible with the latest geolocated pictures. The two military buses in the picture could have been used to transport detainees to the facility and torture and kill them there afterwards. This is more than a guess. The facility concerned was regularly covered by satellites since the year 2000. In the first 23 images, there are no buses parked on the yard. This changes in May 2012. Suddenly a bus appears on the yard, which has never been parked there before. 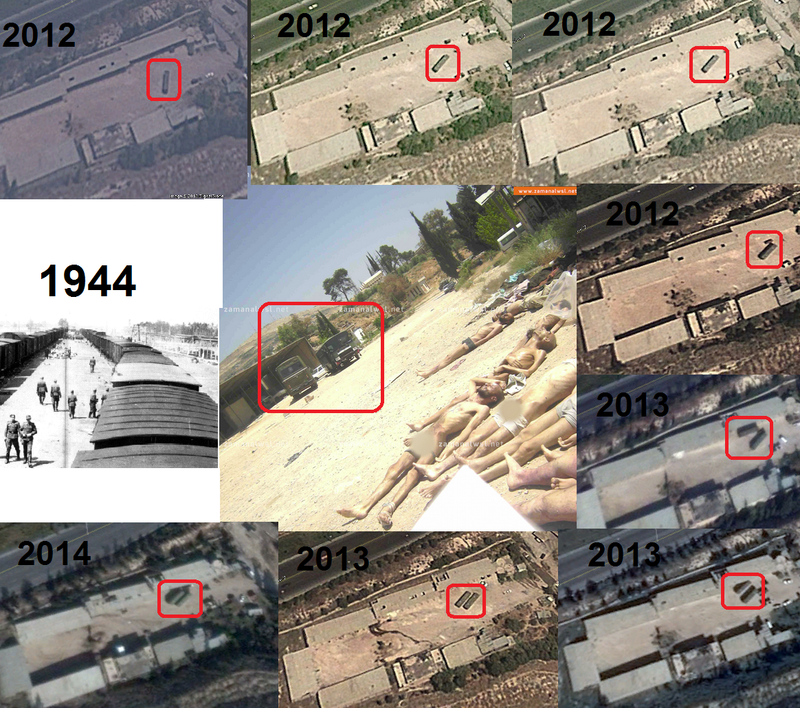 The next 6 orbital images from 2012 show one bus standing at the yard of the camp in each(!) picture. All three satellite pictures from 2013 show two buses in the area. Just as the latest image, which is from January 2014. It doesn’t need much fantasy to imagine, why these buses suddenly appeared parked on the yard on EVERY satellite image since early 2012 and are also present on the released pictures … I still gave some hint on the picture above. While leakers can publish evidence from Bashar al-Assad war crimes and online analysts can make sens of them, it remains to be up to the mainstream media to communicate such findings to decision makers. Finally, it is those decision makers, who have to draw the right conclusions and ACT accordingly. To offer fresh talks to a regime, which’s crimes against humanity are only comparable to those, committed by the Nazi regime in the 1940s, is not just a punch into the face of those actors, just described but also the highest possible disrespect to the victims of that very regime. 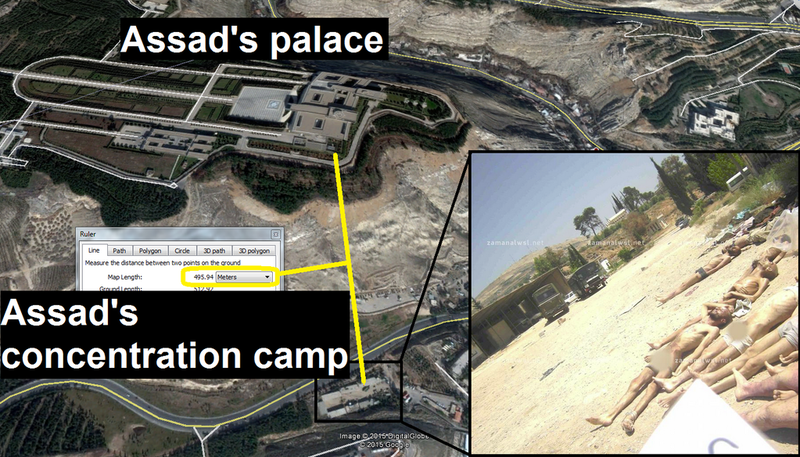 This entry was posted in Syria and tagged Assad, deathcamp, Syria, warcrimes by Julian Röpcke. Bookmark the permalink. Reblogged this on Today in Syria.